The Indigenous People Of Biafra (IPOB) in the metropolitan areas with every obligation do everything in their cache to penetrate every communities in Biafraland. I was privileged to tour certain communities in Anambra State. 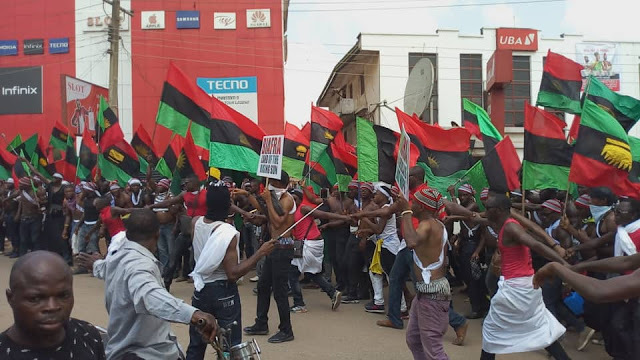 I was enthusiastic to see the Biafraness in that region I found myself. I tour fractional parts of Ozubulu in Anambra State to get first-hand information on ground. I was dumbfounded on what I saw myself. The Politicians are busy penetrating different villages who are yet to be enlightened on the danger of voting. And the fight for the liberation of the indigenous people of Biafra. I found myself amid elderly men and women talking about Election and I gaudily overheard one elderly women aphorism. Stating that the politicians have drafted some huge amount of money to pay anyone who participates on the polling units during this 2019 general election. I took my time to move around Ozubulu, Nnewi, Nza and Ogwu-Ikpele in Anambra State region of Biafraland. I was tempted to ask myself, is Anambra State still part of Biafra revolution? I couldn’t blame the people copious because of the level of poverty this APC led government has brought upon the poor masses. Indeed, appetite is everywhere and the people can’t help it than to take money from these useless politicians in Nigeria who has impoverished her people for their political ambition in the contraption. During the Christmas festival last year 2018, as the tradition of Nigeria has it that each time it approaches the festival period, there is always increase in every petrol stations in Nigeria. But this last year festival, I was surprised to discern that these selfish desperate politicians didn’t increase the price of petroleum products. I now believed what my elderly one told me about the politicians in Africa. The politicians are architects behind the destitution in the country. Just because of the upcoming 2019 general election, the snubbed the increment of petroleum products. The Politicians know what they are doing. These are the strong reasons why IPOB must invade communities to sensitize those communities on why they must not allow the Nigerian political smashes on them. Vile on my observation, I found out that IPOB are tougher in the cities than the villages. In Ogwu-Ikpele Biafraland. A land filled with milk and honey is totally in darkness because of lack of network signal over that region. Immediately you enter that community in Anambra State, you will totally loss network signal. This big community has no motor able road, during the raining seasons. The only root to infiltrate the community is through crossing the River Niger with lack boat. This community is always flooded during heavy drizzle. And they are mostly farmers. But do you know the shocking thing here? The Nigerian politicians without conscience still went over this community to campaign. Sharing N5000 each to any participates; at the end of the day they leave them miserably poor. Ogwu-Ikpele in Anambra State has a lot of mineral resources like Crude oil, good soil for agricultural practices, which the Shell Company and other companies are drilling and about to start full operation in the community. One of the miserable conditions in this community is the poverty level in the land. The Igwe (The Traditional Ruler) in this community refused any development in the community. The man refused to let anything that will bring light to the community in that region. There have been conflicts in the pass years in the community which took thousands of lives. Other reasons why the Indigenous People Of Biafra must sit-up to make sure we are liberated from this mess we found ourselves into. This gospel for the restoration of Biafra Kingdom must be preached in every nooks and crannies of Biafraland. If the election boycott must be effective, many communities must participate and be enlightened. Ogwu-Ikpele lack good social amenities. No good road, no good drinking water, no motor-able roads, no good hospital, no electricity, no good network facilities and yet these politicians don’t see the need to bring good infrastructural development to this community. They are more interested in Electoral processes. Biafra restoration is the cure to this mess our people are into. IPOB must do everything possible to ensure our people are liberated as quickly as possible because the suffering in the land is excessively much. Self-determination is a universal right of any Indigenous persons. The Nigerian state must be dissolved because she is a crime against humanity. We must continue fighting hard for our liberation. Biafra freedom is unstoppable. All hail Biafra the children of the light.